Can you truly get the measure of a band by listening to a remix of one of their songs? Can you really get under their skin, feel the connection, breathe the same air the band did when they made the original? And what about the band that does the remixing? Can you properly understand their intentions, their creative urges, the innate cut-and-thrust of their methods by listening to the results of their tinkering? I’d argue that you almost always learn more about the remixer rather than the remixee, however much a new mix really pushes those hitherto underappreciated splash cymbals right to the fore. So what do we learn about Real Fur through their re-interpretation of Boy Mandeville‘s Gorilla? 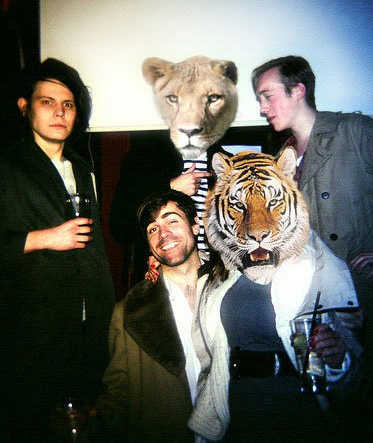 Choosing not to listen to the original for reasons of rank laziness as much as journalistic integrity (ahem), I can only conclude that if Real Fur apply the same lightness of touch to all their songs as they do to the infinitely airy Gorilla, then their own songs must be devastatingly ephemeral. Supple and sinewy, this is a remix – a song – that possesses all the characteristics of a summer breeze: billowing, brief, warm and welcome – and only really noticeable by its passing. Upon which you’ll hit ‘play’ and enjoy it all over again. A brilliantly gentle, blown-kiss of a song. Real Fur are blowing the kisses. Posted on June 17, 2011 by Joe Sparrow. This entry was posted in Headline, Today's New Band. Bookmark the permalink. And here’s a remix of one of ‘their’ original songs! They are playing at our festival and we love them.